Fun fact about me: I am a huge Buffy the Vampire Slayer fangirl. I love Buffy! 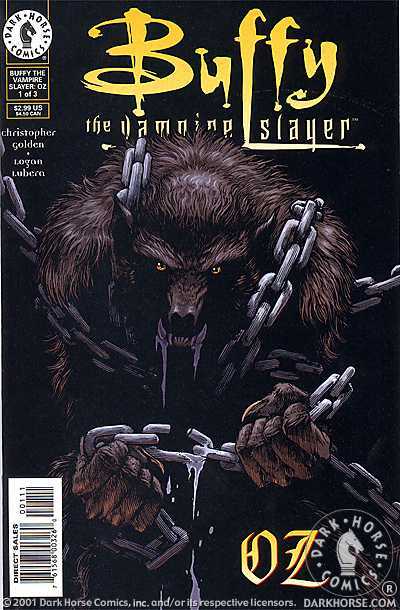 On that note… While scanning the magical interwebs I discovered a Buffy comic I never knew existed, a 3-issue miniseries about Oz! Yay! Released in 2001, Buffy the Vampire Slayer: Oz takes place after the Season 4 episode “Wild at Heart” (the one where Oz leaves Sunnydale after the werewolf trouble with him and Veruca). I managed to get my hands on Issue #1 and you can find my review below! Hated it. First off, Oz didn’t look anything like Oz. In every other Buffy comic out there, the characters drawn look like the characters in the show. Not this time. It twas lame. Second, the style was awful, it looked amateur. I expect better from my comics. The artwork may have been a total fail, but the story wasn’t. I loved seeing Oz as he makes his journey to control his beast. It was excellent. I also like the flashbacks of him and his little cousin (the one who infected him). I can’t wait to see what happens next. There was adventure, fights scenes, and demons – everything a Buffy fangirl wants. I am hoping I can get my hands on Issues #2 and #3, I’d love to see more of Oz. Have any of you read this comic, if so, what did you think?